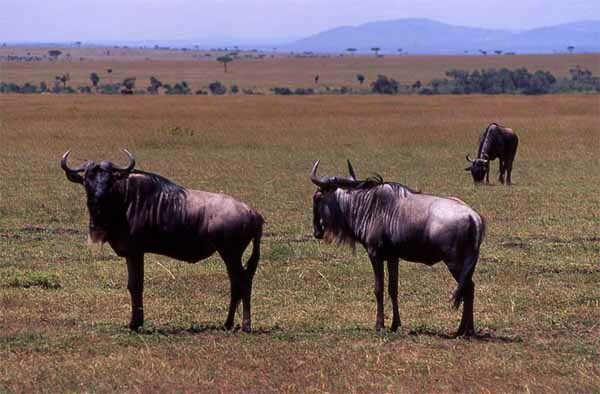 In Africa's cast of players, the ignoble gnu or wildebeest (Connochaetes taurinus) takes the role of clown, for its peculiar looks and its frolicking acts. Wildlife film producers love wildebeest are beloved because of the vast herds they form during seasonal migrations, and as they cross rivers, their subsequent victimization by crocodiles. But wildebeest are survivors, and by virtue of their vast numbers they sustain significant populations of various predators. The huge herds begin forming in September to follow seasonal rains. This pair was photographed at Amboseli National Park, in the shadow of Mount Kilimanjaro, near where the journey begins.